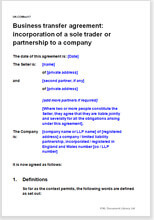 Comprehensive agreement similar to the other business sale agreements, however, this document provides specifically for matters which will arise when selling to your own company. These are agreements for the sale of any type of business by either a limited liability partnership, a company, a by one or more individuals. Net Lawman also host agreements for sale of a company, with or without a business. First, we cover matters common to most or all of the agreements, then we look at each document in turn. Who will use these documents? Any individual or company selling or buying a business or enterprise of any sort. It is usual for the Buyer to provide the sale agreement. However, Sellers can gain an advantage by obtaining the agreement first and making preliminary edits in your favour.